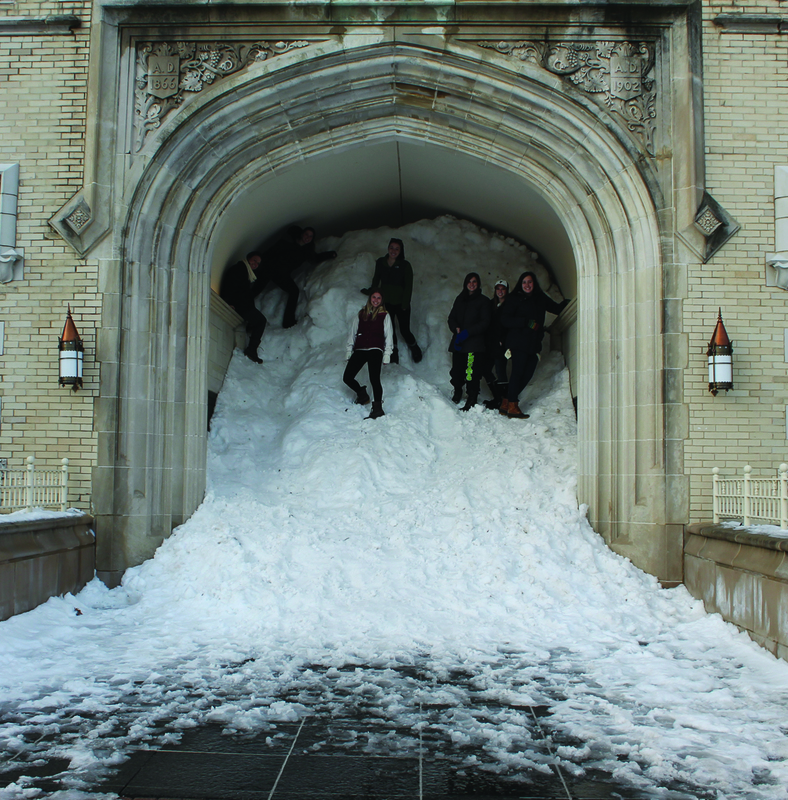 On Monday night, after three hours of hauling snow, College of Wooster students managed to fill the Kauke arch to the top for the first time since 2007. The process began at 9 p.m. and ended just before midnight. By the end of the night, more than 300 people arrived to help, all using buckets, bowls and trash cans to bring loads of snow into the arch. The effort seems to have been sparked when Chelsea Carlson ’16 and Maddy Baker ’16 each made Facebook groups inviting people to come to the arch and fill it with snow, although several campus groups reportedly had similar plans for Monday night. The College’s radio station, WOO 91, put together a live broadcast of the event, including interviews with students, with the help of DJs Ethan Nichol ’16, Zack Moore ’16, Warner Brownfield ’16 and Adrian Rowan ’16. As the arch became more and more crowded, some students made snowmen and forts on the lawn in front of Kauke. 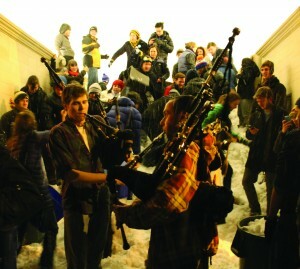 One group gathered snowballs and pelted other students as they continued to dump snow in the arch. The second chant was a reference to a recent email sent out by Dean of Students Kurt Holmes, in which he referred to the Scots as “a hearty bunch” while announcing that classes would not be canceled in spite of icy conditions and frigid temperatures. Holmes, along with Dean for Curriculum and Academic Engagement Henry Kreuzman and Director of Security and Protective Services (SPS) Steve Glick, was spotted at the arch-filling event. Baker and Carlson recall an SPS officer giving them permission to continue filling the arch around 9:30 p.m. “They told us that they wouldn’t stop us from filling the arch, only that we couldn’t use dangerous things such as metal bleachers to fill it,” said Baker. “We all cheered,” she added. Shortly afterward, Dining Services brought hot chocolate for the students. Past attempts at filling the arch have ended less peacefully — in 2007, three students were arrested by Wooster police officers after the crowds at the arch became unruly. The origins of this tradition are unclear, although according to a Daily Record article about the 2007 event, it is believed that the first arch-filling happened in response to a school administrator saying that it would take snow as high as the arch to cancel classes. Regardless, students who were part of the event felt drawn in by the momentousness of the occasion.